Mt. Kilimanjaro, which has three major peaks, is the tallest mountain in Africa. Africa is a beautiful continent with breathtaking natural beauty and vibrant culture. The mountains, plains, valleys, and deserts are some of the unique natural features that characterize the continent. Of these physical features, the mountains are the most outstanding major attractions both for locals and foreigners. East Africa’s Great Rift Valley is home to some of the tallest mountains in Africa. The mountains of Africa are rich in endemic flora and fauna. The mountains are also a hiking paradise, providing visitors with a lot of challenge and fun. Here are some of the tallest mountains in Africa. Mount Kilimanjaro is the tallest mountain in Africa, rising about 5,895 m (19,341 feet) above the sea level. It is located in Tanzania, where it forms part of Kilimanjaro National Park. Mount Kilimanjaro has three main volcanic cones, namely Kibo, Mawenzi, and Shira. At 5,148 m (16,893 feet) above sea level, Mawenzi is not only the second highest summit of the Kilimanjaro range, but also the third highest mountain peak in Africa. Both Kibo and Mawenzi started erupting about one million years ago and are separated only by the Saddle Plateau. Mount Kenya is one of Africa’s highest mountain and it has some of the highest peaks in the continent. Mount Kenya’s Batian Peak is the second highest peak in Africa, after only Kilimanjaro’s Kibo peak, at 5,199 m (17,057 feet) above the sea level. Lenana Peak, the second highest peak on Mount Kenya, is 4,985 m (16,355 feet) tall, making it the fourth highest peak in Africa. The two peaks are located near the center of the mountain and have an alpine appearance as a result of the craggy nature. Batian Peak is sometimes considered two peaks in one due to its close proximity to the nearby Nelion Peak. Ruwenzori, officially spelled as Rwenzori, is a mountain range in the eastern part of equatorial Africa, at the border of Uganda and the Democratic Republic of the Congo. Ruwenzori has several peaks that support glaciers that are major sources of the River Nile. Mount Stanley or Ngaliema is the highest peak of Ruwenzori. Mount Stanley has several subsidiary summits, including Margherita Peak, the fourth highest peak in Africa at 5,109 m (16,762 feet) above sea level, and Savoia Peak, the sixth highest in Africa at 16,329 feet. Mount Speke is the second highest massif on Ruwenzori, with the highest peak, Vittorio Emanuele, as the seventh highest summit in Africa at 4,977 m *16,043 feet). Other notable peaks on the Ruwenzori Range include the Kayanja, Umberto, and Iolanda. Although most of the African mountains are nowhere near some of the tallest mountains in Africa, 75 mountains measure at least 1640 feet above sea level. 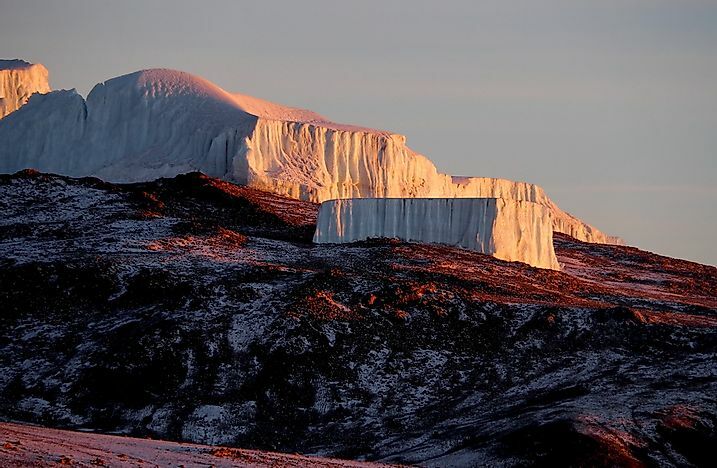 Most of the mountains that are covered with glaciers, including Mount Kenya’s peaks, have significantly reduced in height due to climate change and glaciations. Some of the regions are also poorly described, such as the Ethiopian highlands, making some of the measurements given for the mountains incomplete and not completely accurate. What Is the Tallest Mountain Peak in Africa?